Inspired goodies for people who love food and knives. Being a creature of impulse with little self-control, I find it difficult in my line of work to exhibit restraint. (Each week, for example, I am forcibly ejected for sweet-tooth sins from the ice-cream aisles of the city’s friendly neighborhood grocery stores.) So, I nearly rued the day Chocolatier Blue confections appeared in Utah. Artisan chocolate-maker Chris Blue has elevated the seductive quality of chocolate to a high art form. Since he started in little old Alpine, Utah, a couple of years ago (after a stint as Charlie Trotter’s chocolatier), his talent for combining the purest artisanal organic ingredients into the finest chocolate couverture in the world has become almost sinfully obvious. The elements of his art might include Sicilian pistachios, organic New Zealand passionfruit, hazelnuts from an Oregon organic family farm, fruit from Berkeley’s farmers market and the richest cream from a small Nebraska organic family farm. The flavors change with the seasons. And the best part? These divine morsels are only 35 calories each! Chocolatier Blue chocolates are $2 each at Caputo’s and available in gift-wrapped boxes from 5 to 50 pieces. Having just returned from Italy a few years back, I remember my senses engorged with sights, sounds and smells of Italy’s gastronomic paradise. 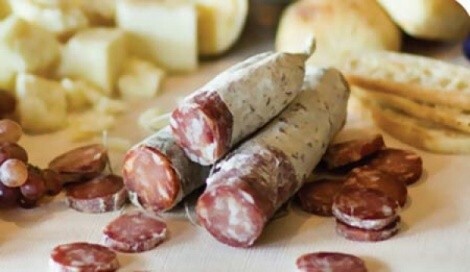 Naturally, I made my way to Caputo’s, where I met the ridiculously talented salumiere Cristiano Creminelli, heir to a talent 500 years in the making, and within seconds of my first taste of Creminelli salami I was transported back to Italy. It took two years, but Cristiano found the right purebred, free-range well-fed pigs in Utah and proceeded to fashion the finest salami in the world. Each holiday season, Cristiano makes what can only be called “reserve” salami. Using the rarest of the truffle family—whole white truffles, shaved—with select choice cuts of meat, Cristiano makes a limited reserve salami run, each encased in a wooden gift box, for about $50. When summer draws to a close, I am seized by an ineffable sad funk; the downtown farmers market food is no more, and my diet—like my mood—becomes a little more leaden. Thankfully, Steven Rosenberg of Liberty Heights Fresh, Salt Lake City’s pioneer of great food, brings yet another great idea to the table for your favorite foodies with his Sustainably Farmed Food Program (LibertyHeightsFresh.com). In a nutshell, Liberty Heights works closely with a group of more than a dozen certified organic vegetable and fruit growers throughout the West to provide a shopping bag full of fresh vegetables and fruits with the ability to add options. There are three levels: Vegan, Vegetarian and Omnivore, ranging in price from $300 to $500 with organic fruit add-on options for a 13-week program of fresh, summery foods—just enough to add extra sun through the dull winter months. My lacerated fingertips will attest to failed careers as a chef and line cook. Still, I like to cut things and play with food and there is no greater pleasure for the amateur kitchen thug than a well-turned blade. A recent trip to Sur La Table took my breath away. While I had long ago abandoned my German steel for Japanese—sorry, Henckel—Shun has stolen my heart with its folded Damascus blades, exotic shapes and ergonomic handles. Well, Germany has caught up and entered the world of Japanese steel with the impressive Miyabi Collection from Wüsthof. 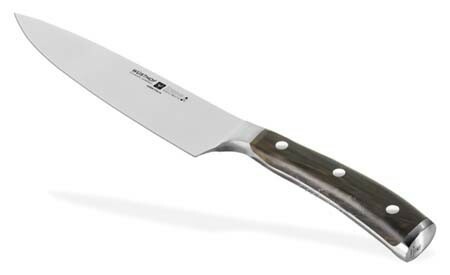 The 8-inch chef blade runs $200, with other sizes priced proportionally. Shun responded by elevating their game further with the dazzling Bob Kramer series. These are pieces of kitchen jewelry that happen to be the most artfully produced kitchen blades made today. The 8-inch chef knife is $340. Once in hand, it’s hard to let these knives go without wanting to prepare a feast for hundreds. These gorgeous knives give the confidence of a world-class chef to even the lowliest hack. It’s always a pleasure to see fine equipment and wish that I had the requisite skill to make it sing. Better still to actually see it affordable. It almost makes me believe that dreams do come true. From the legendary French Mauviel cookware company, a five-piece “essentials” set is priced perfectly for Christmas: marked down from $1,020 to $650.